It's always fun to find out about the artists responsible for creating the illustrations that have been permanently burned into my brain since early childhood. Just look at these beautiful cereal box packages designed by Roger Bradfield. I don't want to slam today's talented and hard working cereal-box designers because I'm sure that they would love to come up with designs that are as elegant and appealing at Bradfield's. It's not the fault of illustrators that many modern packages are hideous. The blame goes to the brand managers at cereal companies who think they are art directors but have no artistic taste. The leering, brain-damaged rabbit looks frightening. Dan Goodsell of A Sampler of Things has a nice write-up on Bradfield. I sent [Bradfield] an email to see if he had worked on any kids food. Well he wrote back and told me that he had worked on the General Mills cereal boxes of the early 60's! 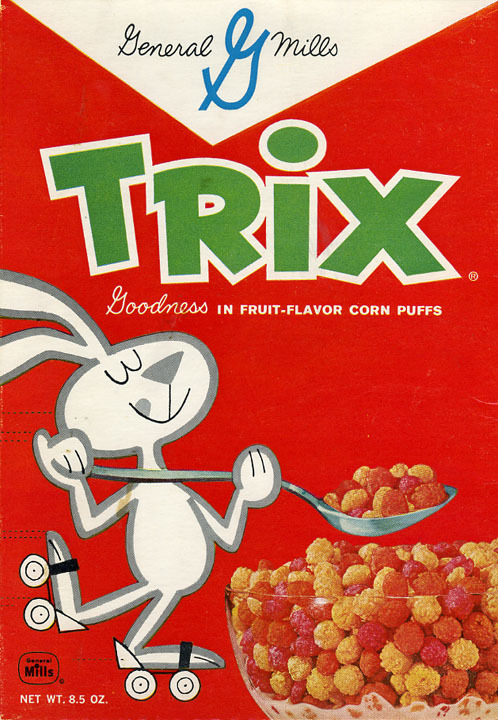 He had worked on Kix, Trix, Wheaties, Jets and did the fronts for many of the signature boxes of the time. WOW. He also did some work on Mr Bubble and some Pillsbury projects. 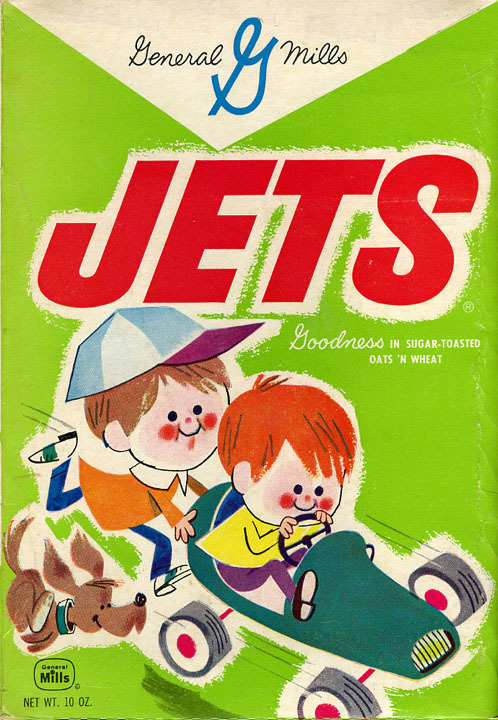 One other great thing he did was all the spot illustraions for the Bisquick Cookbook in 1964. It is amazing to see all the creativity and skill he poured into this book so I scanned a few of my favorites. Roger continues to paint and many of his great kids book from the 1960's & 1970's are now being republished. It is great to think that his incredible artwork will be enjoyed by many generations to come.